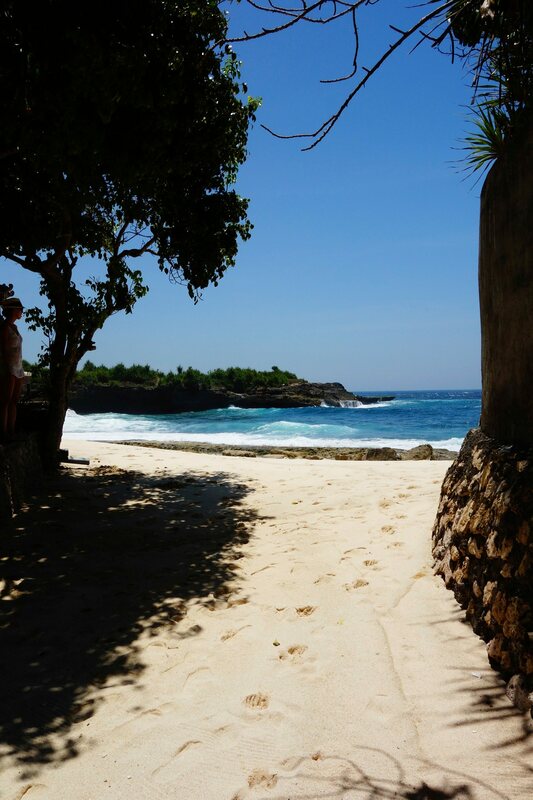 This small island, half and hour away from Bali coast, is a little piece of heaven on earth. We enjoyed our 3 days stay overthere. Caroline really wanted to get there to dive with the Manta Ray and moon fish (or Mola-Mola in Bahasar). She came here 3 years ago and she was quite keen and happy to come back with myself this time. 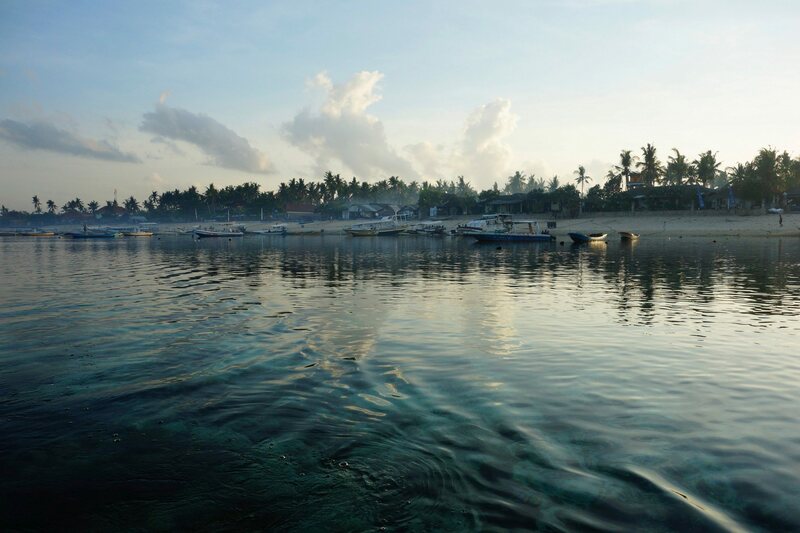 Although, after 5 days at Gili Island, we were not sure if it was worth going there as we were leaving four days later to go to Sulawesi. 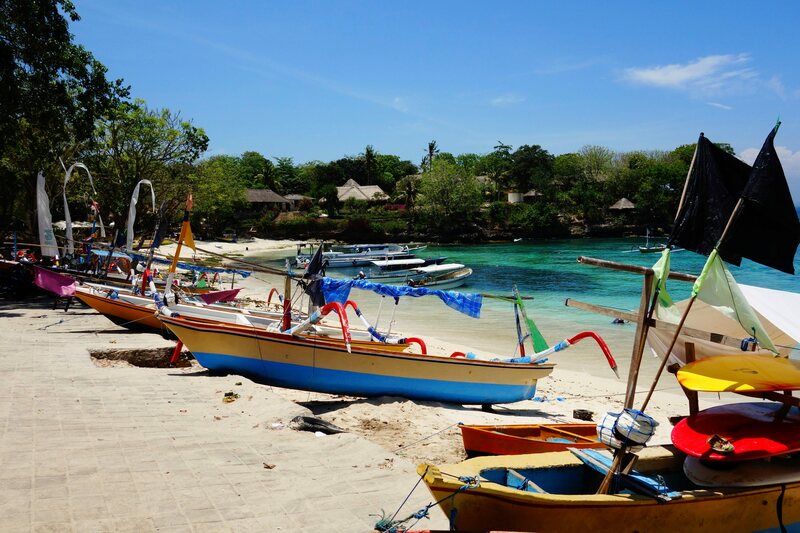 Coming to Nusa Lembongan involved as well some travel (bus and boat). Finally, we gave a shoot, we went and we don’t regret at all. 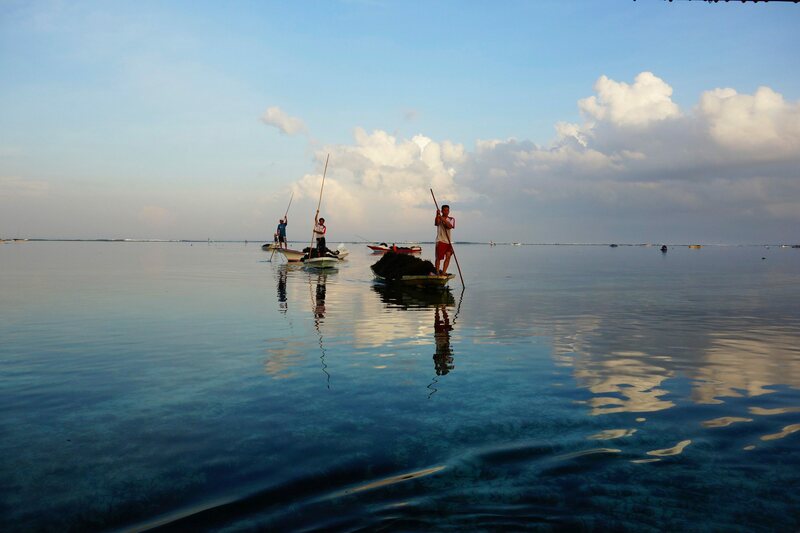 Local people are quite nice, life less expensive and less tourists then at Gili Island. I would say this is a good alternative to Gili Island which may end up like Kuta in a few years (crowded and noisy). Just arrived and we have found already an accommodation (Kenta Homestay).The owners are driving us on their scooters to different dive shops so we can book our dives for the next days. We will finally choose a small and friendly dive centre owned by locals and where the dive master doesn’t have groups larger than 4 divers. 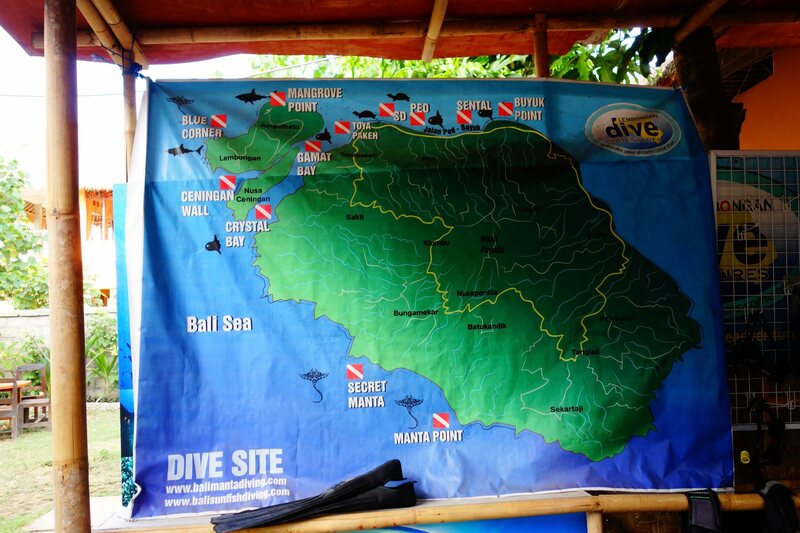 We plan 4 dives over two days including the famous “Manta Point” where we should see Mantas. The divemaster picked us up at 6am the next morning for our two first dives. The afternoon, we are renting a scooter to ride around the island. The north is surrounded by a coral reef therefore its water are shallow, warm and calm. While the south part is open to waves (some nice ones to surf), the water is colder and there is little beaches between the cliffs. We go dinner at Maria Bamboe, on the other side of the island following the advise of our german neighbours at Kenta home stay. For 6.5 dollars for both of us, we ate quite well. The next day, it is Caroline D day. We go diving with the mantas. It is only the 5 of us as we cannot spot any other boats. Which is much better. Indeed, the more boats coming to the spot, the less chance you have to find mantas. We arrived at the first spot, and can already see one. We were ready to jump into the water but the divemaster stopped us. The manta is gone scared by the line of the fisherman sitting on the cliff just above us. We are leaving to the second spot where we can spot again a manta. Lucky us… This time we jump straight into the water quite quickly before the divemaster stops us… Caroline and I are the first divers in the water. The visibility is quite poor as it rained the night before and the cliffs got washed. We can see the manta and Caroline starts to follow it. It is so big but looks so majestic in the water. At the same time the two others divers are getting into the water and I am trying to follow caroline. Suddenly I can see something on my left side with a fin on the top part of the body… hum…but I can quickly see there is another fin at the bottom.. A Mola-Mola. I try to catch up Caroline to let her know but she is too far and the moon fish is going away probably scared by all of us. The Manta is gone too. That’s it for the day. We are leaving the island on the afternoon so we can catch up, on time, our morning flight to Sulawesi which is our second major stop. Here we go. 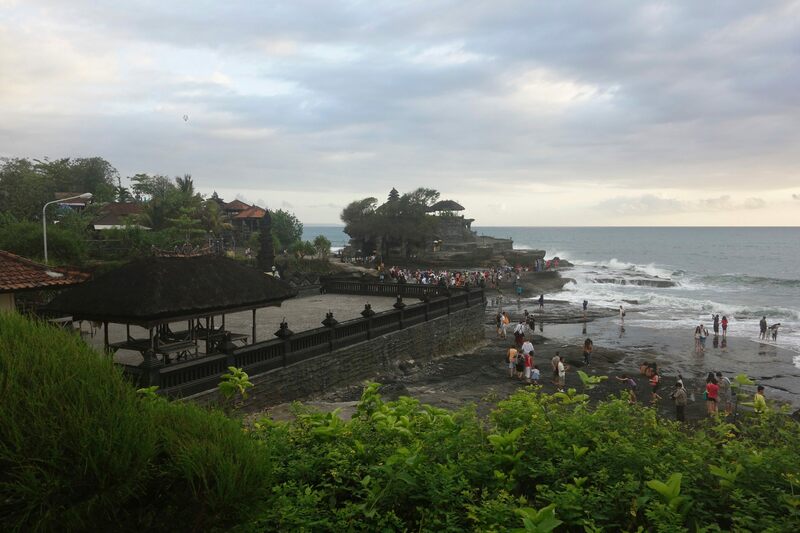 Bali is our first world tour stop. 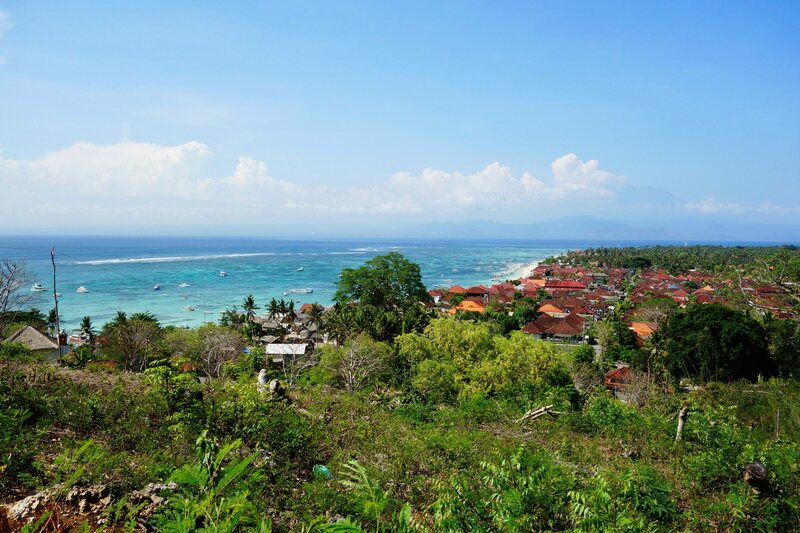 We will spend two days there before going directly to Gili Island and Nusa Lembongan. 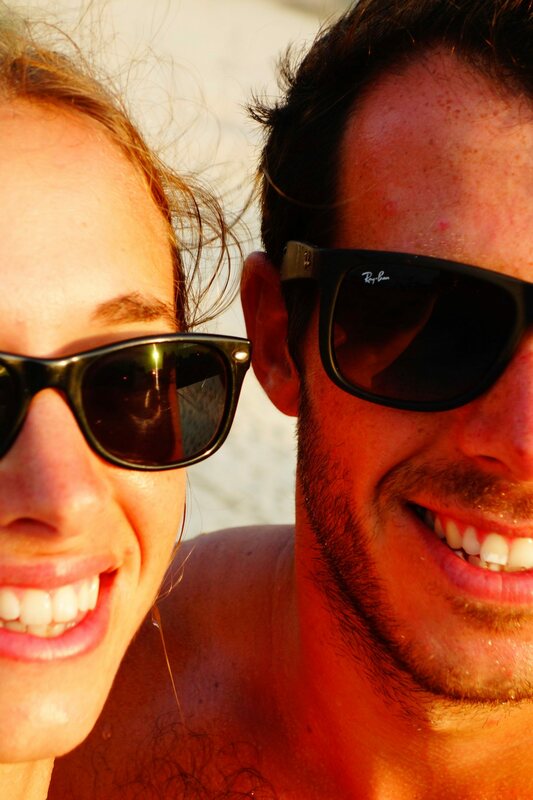 After 6 hours Jetstar fligth , we arrived in Bali, a very famous and popular destination for aussies. We left Sydney around 5.30pm with 25 degrees celsius and 4,700km later, we arrived in a oven warmed up at 30 degrees but with 80% humidity while it is already 9pm. We negotiated a taxi to get to our hotel. In fact we didn’t negotiate as when you do so, the driver will start at a price 3 times higher than the standard fare…So we went to the official taxi company and ask for a fare to our hotel. We found a cute hotel in Kuta for just 12.5$ the night for both of us including breakfast. – a first day for us to arrive, fix some issues (vodafone phone not roaming, internet..) and spend some time checking around to get an idea of Kuta, its beaches and life. 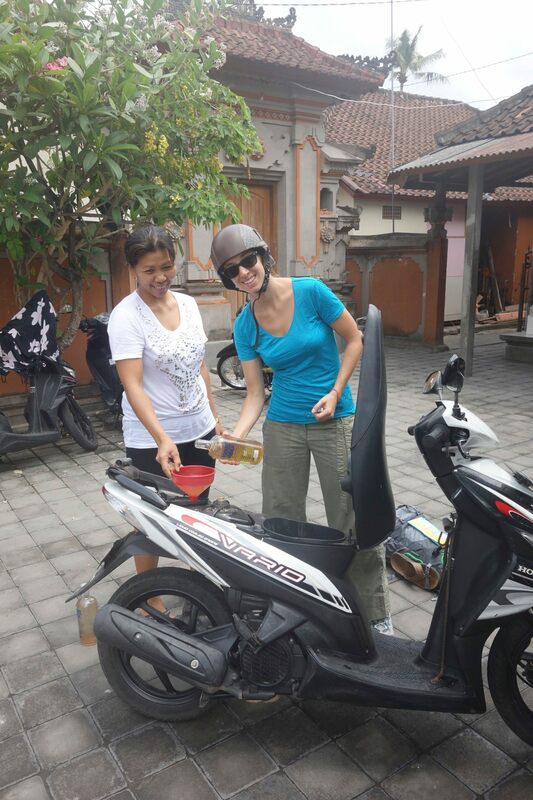 – a second day where we rent a scooter for the day to explore some of the great temples that Bali has to offer. Even so Kuta is cheap, this is not really the dream location for your holidays. Yes, the beer is cheap, food and accomodation too but we didn’t find anything special. Fortunately, our scooter trip gave us a different vision: Bali temples which still show that 95% of the population is hindu. 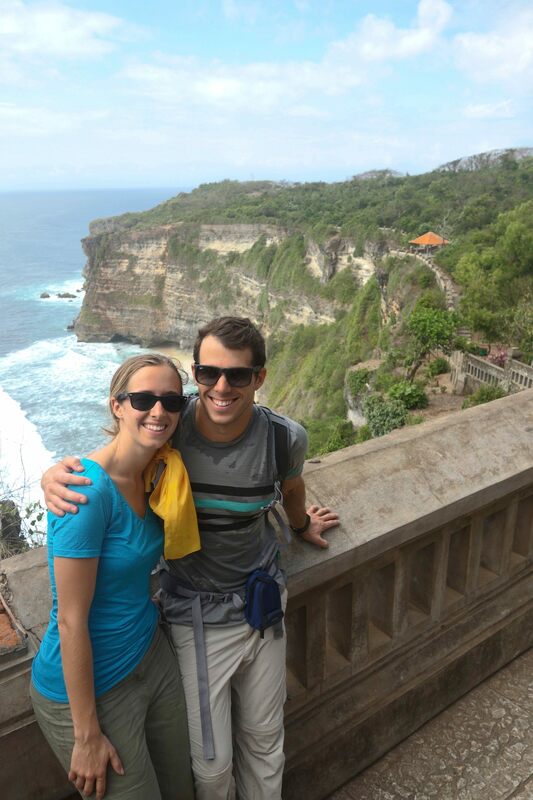 We start visiting the Pura Luhur temple located at Uluwatu. 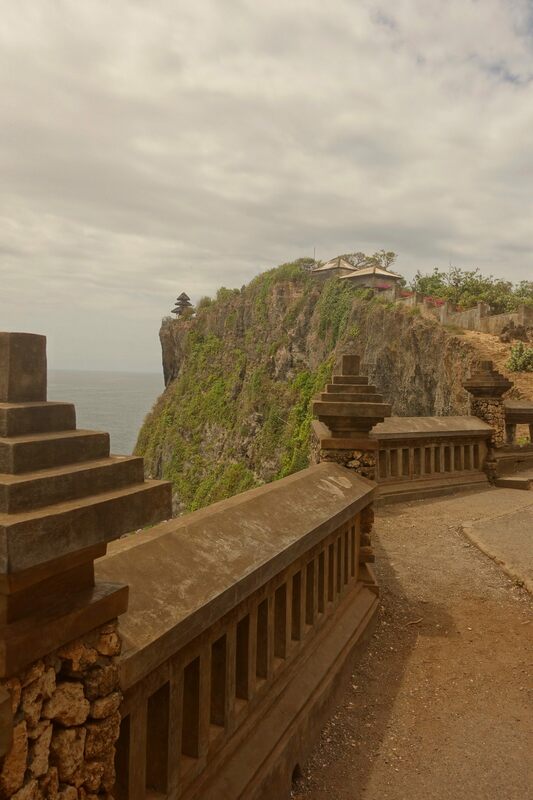 Built on the 11th century, it is one of the most spectacular temple as it is sitting atop the cliffs overlooking the surf at Uluwatu. 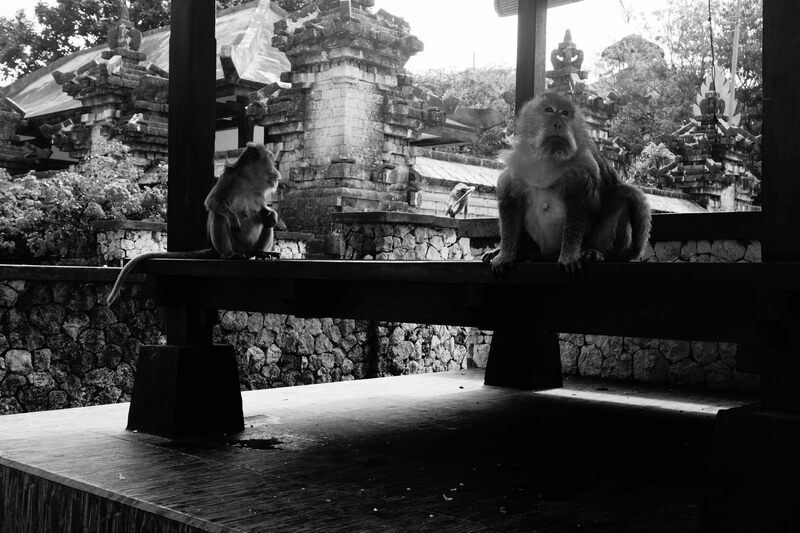 This temple is home of numerous monkeys ready to jump on you and steal your sunglasses,hat or food. Luhur means “something of divine origin while Uluwatu can be broken into “ulu” which means “land’s end” and “watu” means “rock” in the old language. 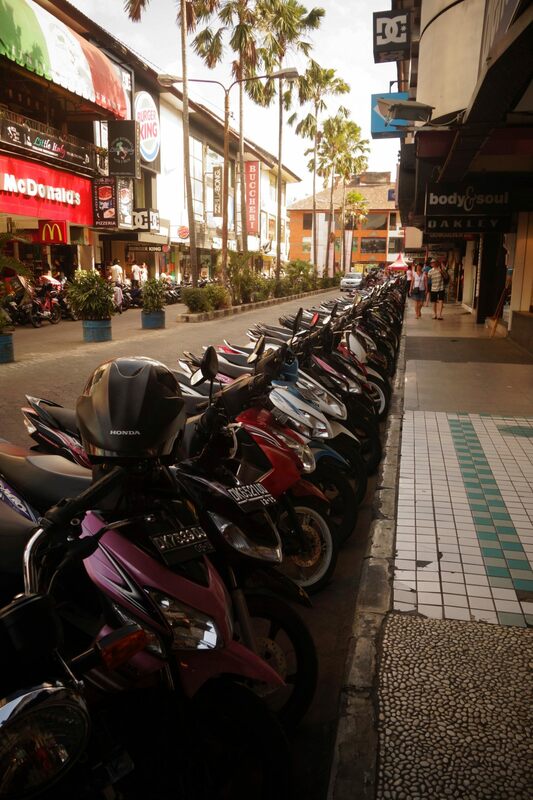 Riding a scooter in Bali is quite special. You need to learn how to use the horn, something we don’t do enough in Sydney.. With it, you have all the rights. I would compare it with our indicators.. You overtake someone , but a car is coming. You just horn and both cars (the one you overtake and the one coming) will go sideways to leave you enough room. And sometimes this room is just enough..
You want to warn a pedestrian that you may hurt him as sometimes people ride or drive on three lanes when actually there is only two lanes. Just horn and he will move or run. You fill the petrol tank using some used bottle of alcohol that people sell in the street. This morning we filled the tank with a bottle of vodka then with a bottle of rhum. Nice..
We came back to our hotel alive and join two friends from Australia with who we will leave the next day to Gili Island to trek the Rejani volcano. 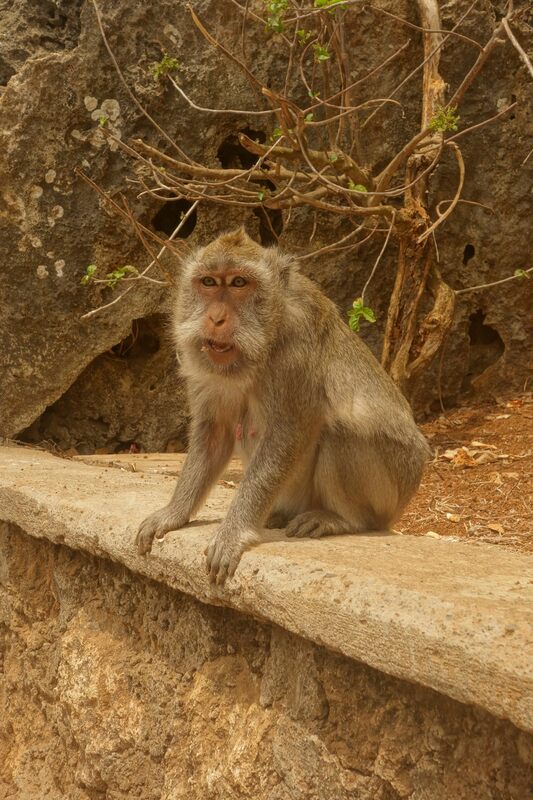 The trek and the Gili Island will be two topics of our next posts.